Welcome to the spring installment of the Seasonal Simplicity tours! 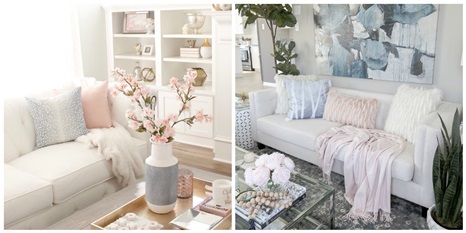 Several bloggers are joining together to provide oodles of inspiration and ideas for decorating your home for spring. 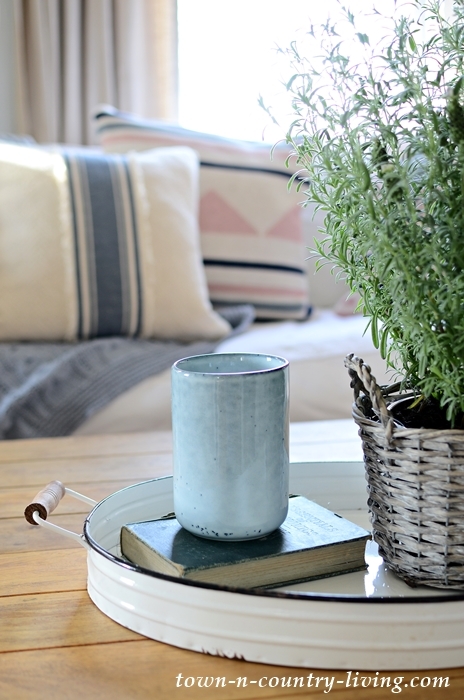 You’ll find links to their spaces at the bottom of this blog post, which focuses on adding spring colors to your home. Welcome to those of you coming here from Sincerely Sara D! My front porch is uber-simple right now since it’s still a bit chilly out. I found a carrot “wreath” for the front door and added an orange pillow to the white folding chair. 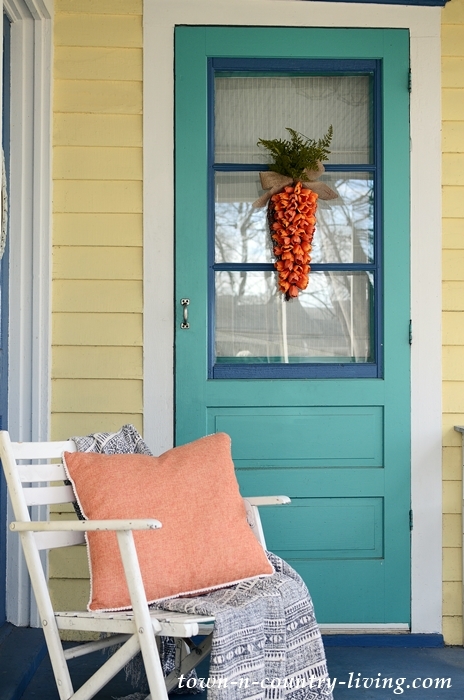 I love using orange on my porch – my exterior house colors are on the bright side and I feel like orange matches the saturation and plays well with the yellow and blues. Step inside for more spring colors! Subtle, but just enough to freshen up the interior spaces. 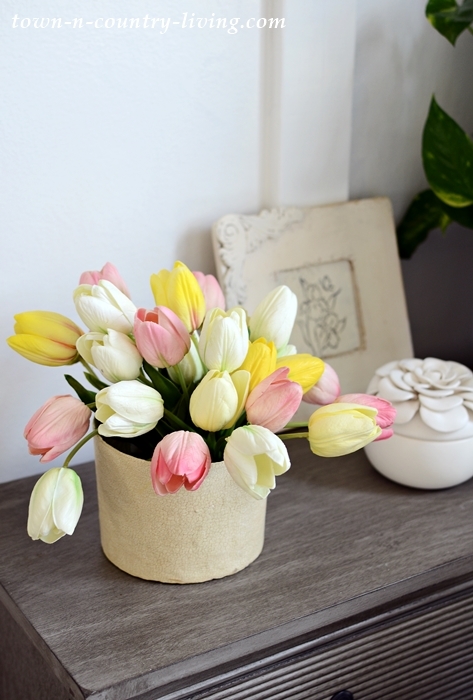 A charming basket of pink tulips is the first thing you see when you enter my home. 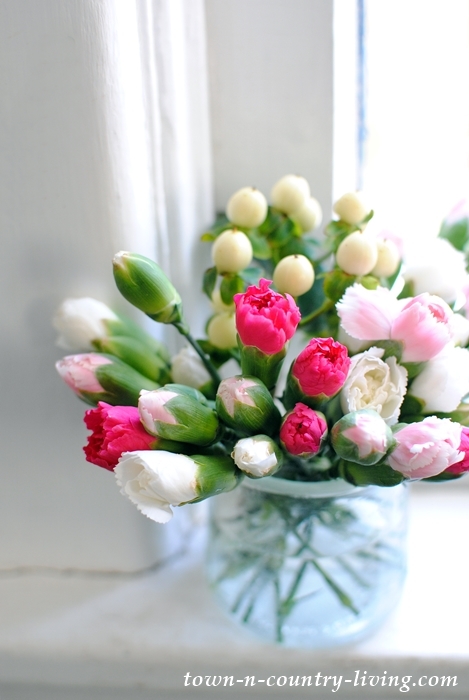 I love flowers and you’ll find them throughout my house – no matter what the season! 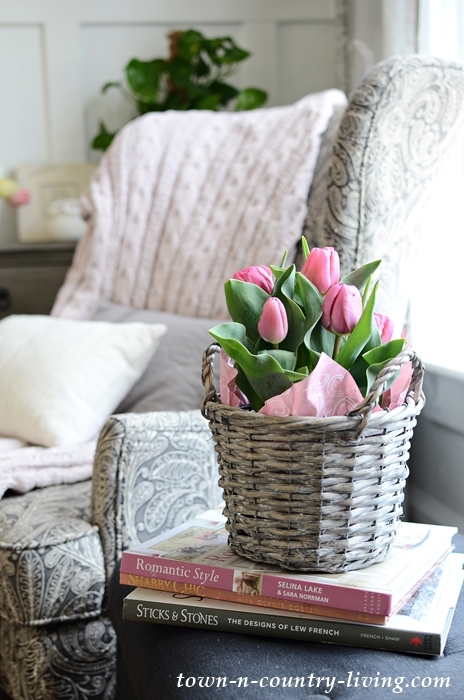 A dusty pink, lightweight woven throw graces the chair in the entryway – to emphasize the color of the tulips. Notice anything new – besides the hanging plant? We added board and batten to this space that joins the dining room! I also painted the upper walls in Benjamin Moore’s White Dove. I’m currently looking for a new rug. 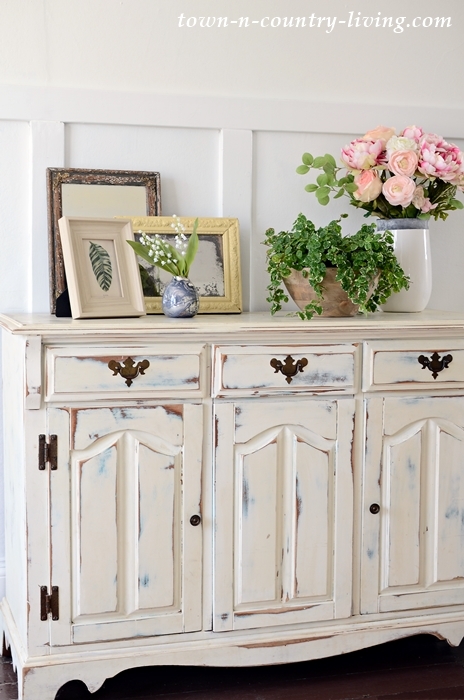 On the small gray cabinet is the tulip display you might have seen in last week’s spring kitchen. Moving items from room to room often provides a fresh new look. 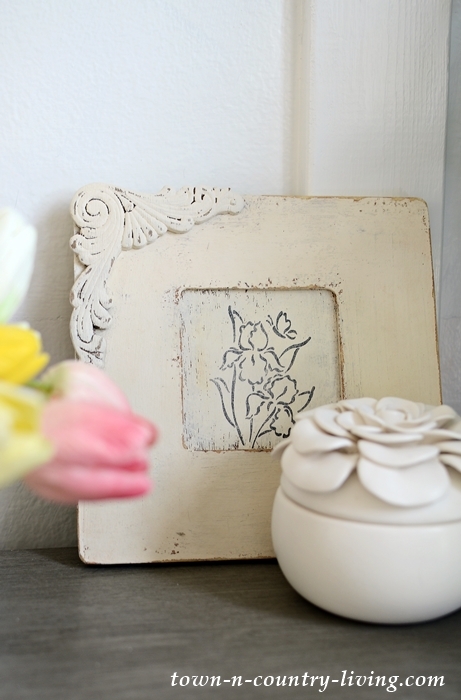 I don’t remember where I found this little picture with its shabby chic frame – but I remember choosing it for its simplicity and charm. Since the entryway is an extension of the dining room, I’ll give you a sneak peek at what’s going on in this space. The new board and batten wraps around every wall and I just love it! It added a bit of dimension that this room needed. 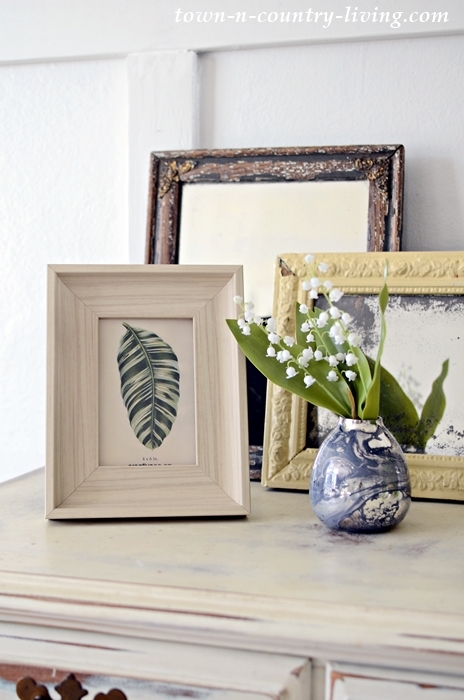 This little vignette might look a bit familiar – some of the items were displayed a couple weeks ago, along with the Easter Egg wreath (which has now moved into my sitting room). Along with the pink in the entryway, I pulled in the spring colors of blue and green. 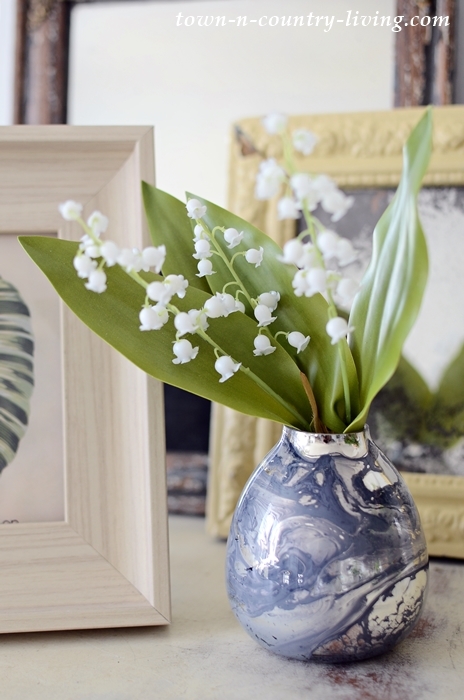 I’m still crushing on this swirly vase that reminds me of how some Easter eggs are painted. 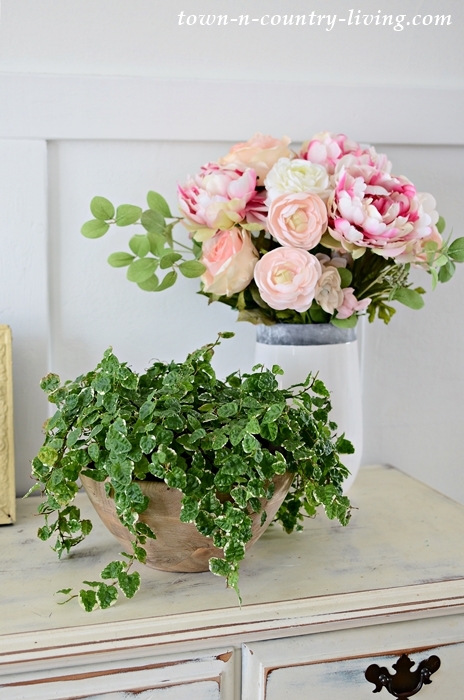 The ficus plant that used to sit on my console table is still going strong and now pairs with a vase full of faux flowers from Michael’s. If you read my blog regularly you remember my guilt over spending too much money on the flowers – but they’re just so pretty! I’m normally not a faux flower type of person, but I couldn’t pass these up. You’ll find more spring colors in my family room. I continued the pink and blue in here with new pillows from HomeGoods. This in turn provided the opportunity to move my light blue vase in here. I left it empty and paired it with a new lavender plant that I’m managing to keep alive. 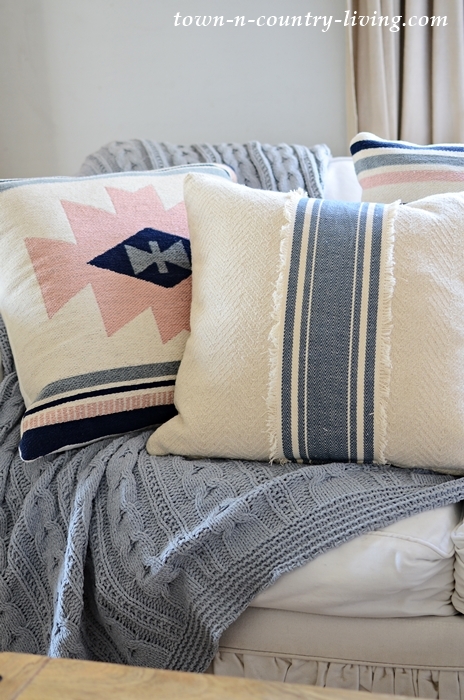 A lightweight blue-gray throw adds a bit more hue in the way of spring colors. This is the same throw as seen in the entryway – just a different color. 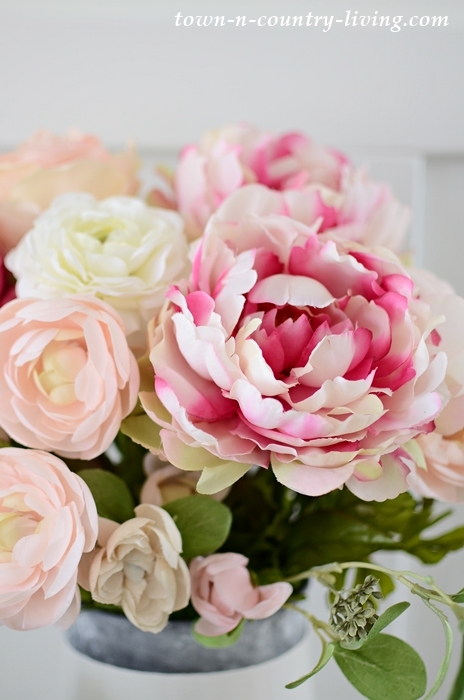 Dark and pale pink carnations always add a fresh spring vibe. I try to buy bunches that have several buds so that I can enjoy the flowers for a longer period of time. 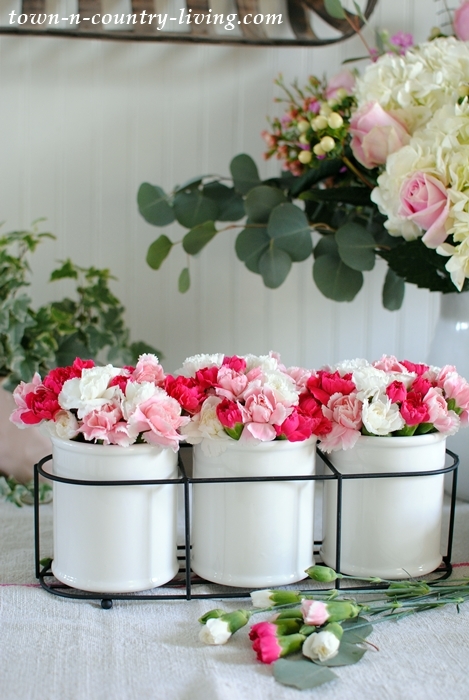 I filled kitchen utensil crocks with more of them to create a simple centerpiece for my breakfast nook. What spring colors do you like to add to your home? 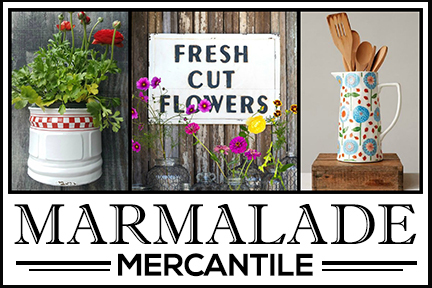 For more spring decorating inspiration, be sure to visit my friends below this week! A special thanks to my friend Krista at The Happy Housie for organizing this seasonal event. 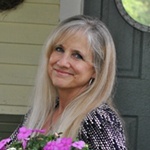 Make sure you visit her spring home tour – talk about spring colors! You won’t be disappointed – it’s beautiful! 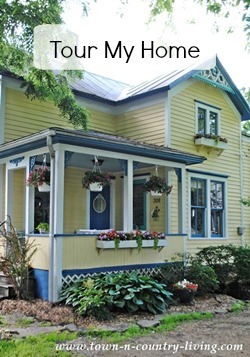 Next on the tour is the beautiful home at Confessions of a Serial DIYer. 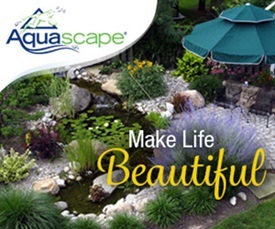 Your home looks just amazing! It was nice to see your family room again. We don’t see it very often and it looks like such a cozy place to be. 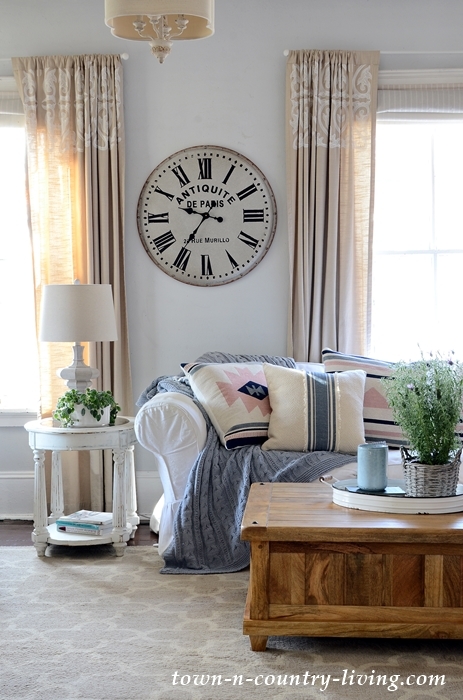 The furniture, rugs and accessories you’ve added the past several months are perfect. You must be so proud of what you’ve done. Beautiful tour, Jennifer! I love your big cozy and comfy looking couch – so pretty! And your pops of colour for spring are perfect!! So glad you could be part of this tour series! Thanks, Krista! And thanks for organizing this week’s tour!! Jennifer everything looks pretty as always. Adorable carrot wreath. The touches of pink throughout the house is lovely. 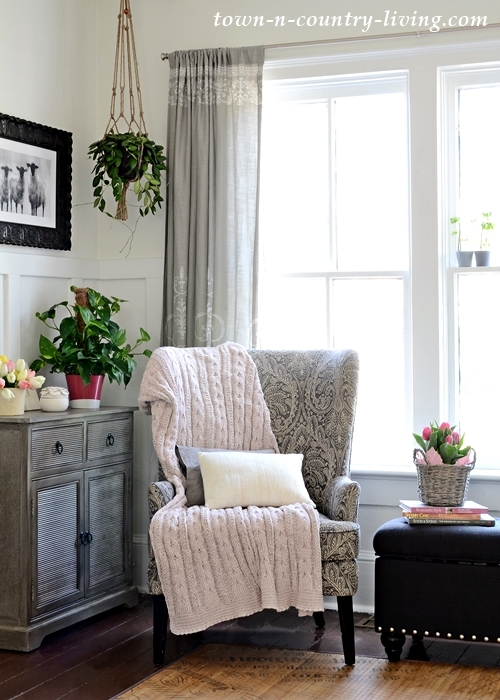 Jennifer, your spring home tour is so pretty! I’m loving all the subtle touches of pink – I’m obsessed with the color! Jen, oh my goodness I am so charmed by those lilies of the valley!! They used to be my favorite flower as my dad grew them in the backyard. I can just smell them now!! Lovely! Your spring tour is so pretty, Jen! I love all your floral vignettes. And also love your new pillows. Your home is always so inviting and welcoming. I love all your beautiful flowers and pillows Spring has certainly arrived at your house and that carrot on your door is so very adorable. I know you are super busy right now but i would like to see a before and after of all you have done it’s hard to keep up with. Have a great week. So beautiful! Thanks for sharing your home all decked out from warmer weather!